Then the opportunity presented itself. Last week, I was tasked to find a good place for dim sum, which of course in our Singapore context means cheap and good. I had almost settled on a place in Chinatown until a chance reading of a blog brought my attention to Ah Yat Restaurant at Turf City. The blog was written some time back but that did not stop me from being seduced by the all year 50% promotion for dim sum. 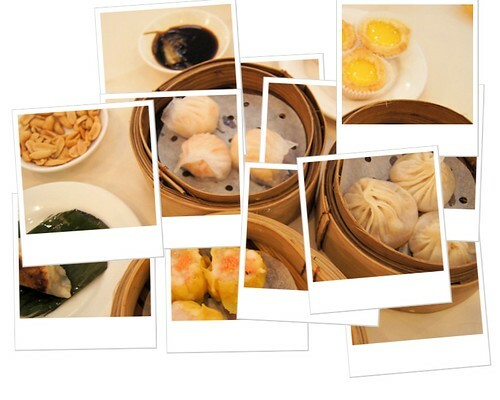 Imagine dim sum at half price! Suddenly casual restaurant dining became very much affordable for me. Thanks to the MRT, Singapore has become even smaller and after three transfers - MRT-public bus-private bus (service 11) - I was in the former Turf Club in no time. The original plan to take Turf City's shuttle service from Toa Payoh MRT was dropped, as it would be a hassle to travel to Toa Payoh, and find out where to board the shuttle and to have to wait for it. Where is Turf City's entrance from Dunearn Rd? Having explored two cemeteries in the vicinity [here and here], familiarity bred confidence so I tried my luck at Swiss Club Link. It was a short walk upslope but thankfully the gate was wide open. The name here is a lttle misleading as there is another Swiss Club Link at the Swiss Embassy further north, connecting Swiss Club Rd with Jalan Kampong Chantek. Why did they reuse the name for this road to the Turf Club? While I believe the Embassy of Switzerland is not in the Swiss Club area by mistake, the Turf Club is no Swiss Club and the road should be named otherwise. One can still find bits of heritage from the Turf Club days lying around. This one was on an aged lamp-post. What is this? 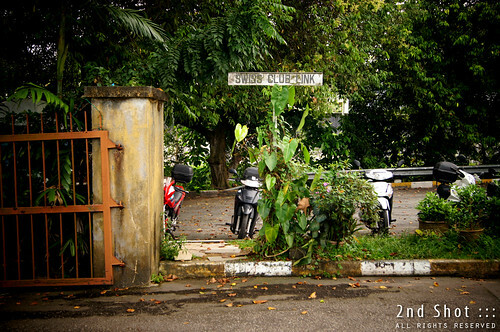 Swiss Club Link was probably a side entrance to the Turf Club, judging from the pillar and gate. 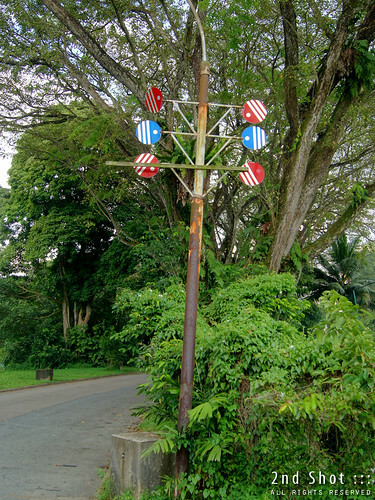 An old road sign for Swiss Club Link. The car-park is double-storied with the ground level utilized by car workshops; the whole place feels like an automobile hub to me. Actually the car-park building shouldn't even be there, according to a late 1950s photo I brought for my "mission". Arrgh, there goes my chance of a perfect second shot. 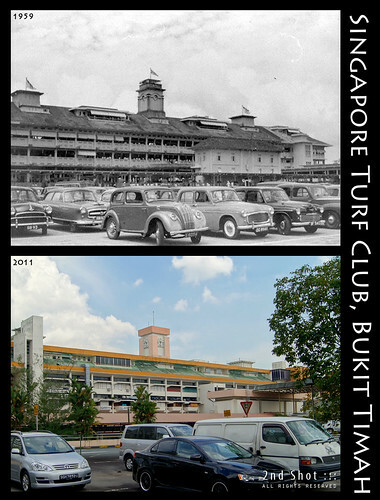 From Turf Club (1959) to Turf City (2011). What has changed, and what has not? There was a coffee-shop before the entrance of Turf City which nearly waylaid my plan of lunching at a restaurant. Next time perhaps. Turf City is basically a mall today but with no throning crowd on a weekend. Where is Ah Yat? When I finally found the lift lobby, a group approached from another entrance that was so much nearer than the one I used, so much so that I could even see a bus parked outside. The shuttle bus? Oh well. Ah Yat is on level 3 (they also occupy level 2 which is like a banquet hall) and I shared the lift with another group eager for their lunch. While the mall was quiet, this group gave me a premonition the restaurant was not going to be so. Indeed if the 50% promotion was to attract more people to patronize their branch at Turf City, they were quite successful, as the sight outside the lift told me. Almost every table ordered dim sum. Once seated, I scrambled for the paper and pencil. There can be no delay when missus is hungry. On the menu slip, I scanned rapidly for the usual orders - Siew Mai, Har Gao, Xiao Long Bao etc. My personal view is that a Dim Sum setup live or die by make or break with these "classic selections". Since I do not want to be seen promoting or criticizing Ah Yat's dim sum too openly, I shall leave you with that photo at the beginning of this blog. Suffice to say, we enjoyed our meal and their service was fine too. 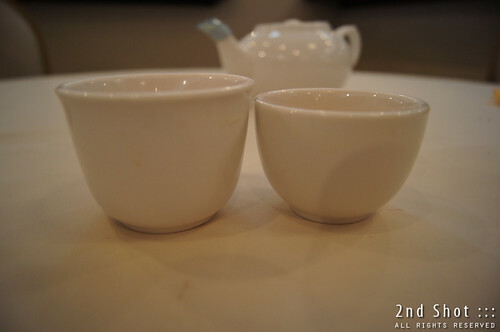 I shall however comment on the size of the tea-cups served to us. Why are they not of equal size? They gave us a box-seat (our table was inside this box) on the steps, to my delight. Why are there steps in the restaurant? 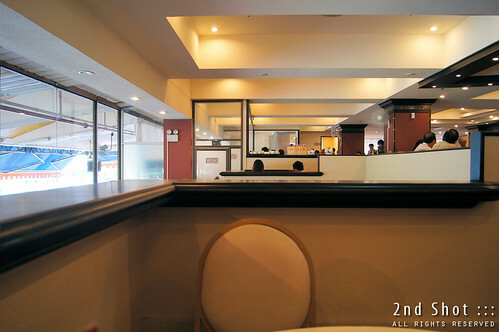 Then it occured to me Ah Yat is located on the Main Grandstand of the old race course, the steps are like a viewing gallery and where we were dining could be the site of the exclusive Owner's Lounge forbidden to the public. 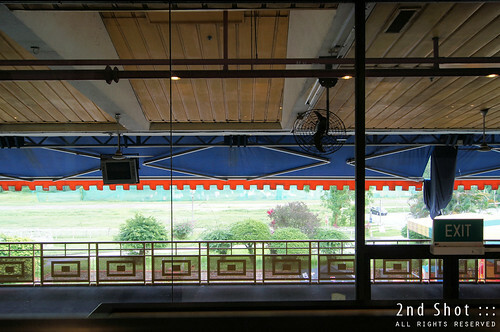 Coincidentally there is one at the Club Level (Level 3) of the Turf Club at Kranji [link]. Our box-seat affording more privacy than in the common areas. I guess no harm in thinking ourselves as VIP with a good view of the horses. Spectacular view of the race-course once reserved for the rich horse-owners? Stomach full, it was time to count our damages. I asked for the bill. Do you think it was worth it for two people? We ordered seven plates/containers and the 50% discount worked out to be $16.20. The net bill was $21.00 after deducting the discount from the subtotal of $37.20. Add in service charge and GST, this dim sum lunch set me back by $24.72. The service is terrible! Not only have to wait ages, (By the time the chilli crab came, all the other dishes cold alr) cannot tahan the staff clearing dishes in a manner no different from the hawker centre. Throwing the dishes into big container and making so much noise - jarring to the ears. Agree with Chun See their services can be improved! It was not easy to grab their attention (perhaps they are under-staffed?) and it could be worse if they had to clear the dishes like a typical restaurant - too many round trips to the kitchen! Yes, their xiao long bao, better dont order to avoid disappointment. The mall feels quite 'dead', not sure how the tenants survive.